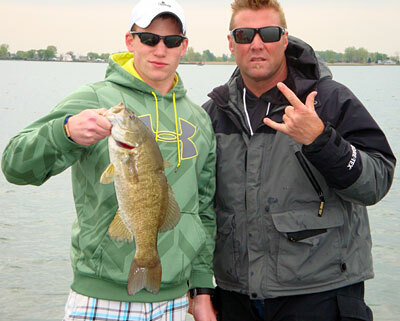 The team of old$chool, Jay-MadWags and Evan Wagensomer worked together to SMASH the winning weight record for the spring East MadWags Memorial Members Tournament on Lake St. Clair Saturday, May 12, 2012 with a GIANT 5 smallmouth bass limit measuring 27 POUNDS!!! 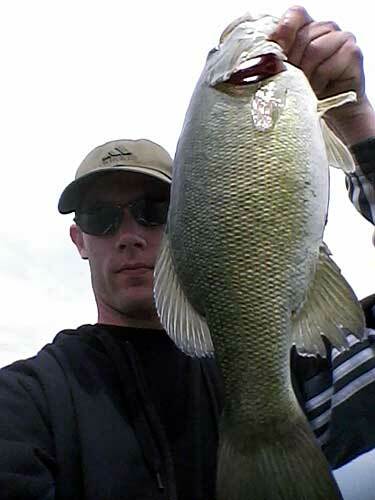 That was anchored by the Big Bass of the event - a TOAD 6-2 smallmouth bass! We had another big turnout this year with 21 boats and 49 total anglers but I felt having our special guest: David Wagensomer's son Evan fish with us for his first ever bass tournament to be one of the real highlights! So glad he fished and that Mom Liza Wagensomer made it to the weigh in / cookout / awards ceremony! We also had another youth fishing his first tournament ever - Duncan B - fishing with capt charlies charters and Cheetam. 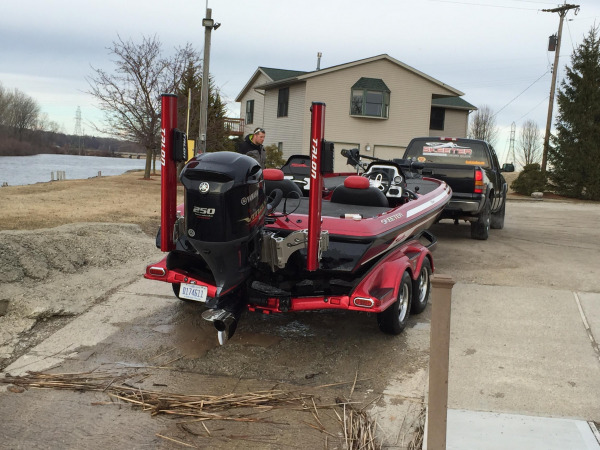 Duncan landed the big bass in their boat too! Youth angler Andrew L returned for his 2nd event too fishing with his Mom Laura and Uncle t-bone! I really love that this event gets such a great mix of anglers! We actually had a tie for Big Bass this year with TWO 6-2 smallmouth bass!! The team of MaizeNBlue and TritonTR20 were awarded 2nd big bass since the heavy stringer tiebreaker went to champion old$chool's boat! Another change in a coveted prize category - bassfan586 tried hard to win ANOTHER Big Ugly title with an almost 4 pound Northern Pike but out of nowhere 'Don't hate me 'cuz I'm beautiful' Cheetam banged down an 11.39 pounds fish only a mother can love (just kidding) - a big ole Channel Catfish caught on a drop shot!! 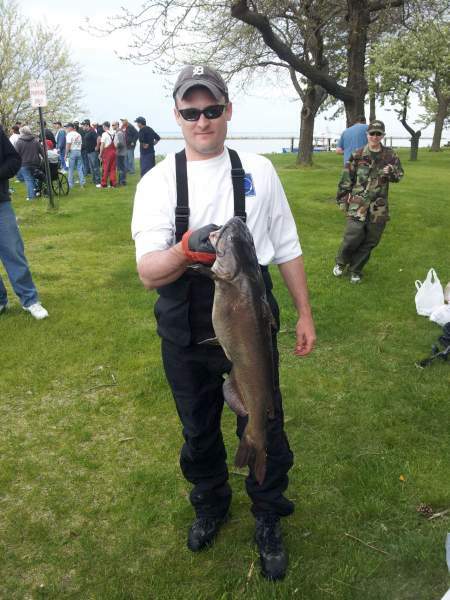 Lake St. Clair is actually a trophy class Channel Catfish destination with tons of whiskered fish this size! No sheepshead this year though a giant rock bass and pound and a half white bass (caught by youth angler Duncan) were also brought to the scale. 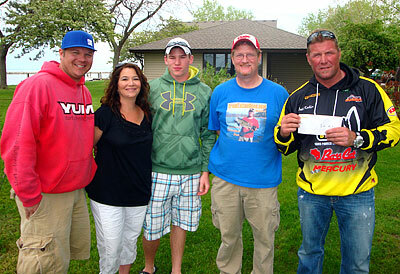 The 2012 record setting winning team and family of the spring East MadWags Memorial Members Tournament on Lake St. Clair of Jay-MadWags (L-David's nephew), Liza Wagensomer (David's wife), Evan Wagensomer (David's son), me - djkimmel, and old$chool (Todd Koehler - close friend of the family)! * MadWags Memorial Members Tournament East Lake St. Clair winning weight record! Please make sure you check out the additional persons who helped make this event more fun and successful along with the GreatLakesBass.com Sponsor Advertisers who make this Web site possible! Some more pictures from the 2012 MadWags Memorial Members Tournament from the various members who fished with us on Saturday. This is what it's all about! Members, families and youth anglers enjoying our great fishing! Here's Duncan B. fishing his first tournament ever. I'm honored he chose us to try it out! 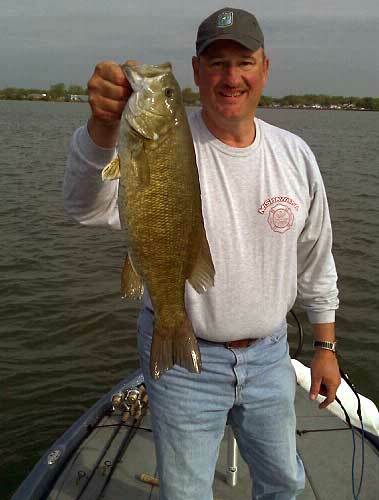 Duncan fished with capt charlies charters and Cheetam catching this, their largest smallmouth bass of the day! Congratulations Duncan! You look like you had fun!! 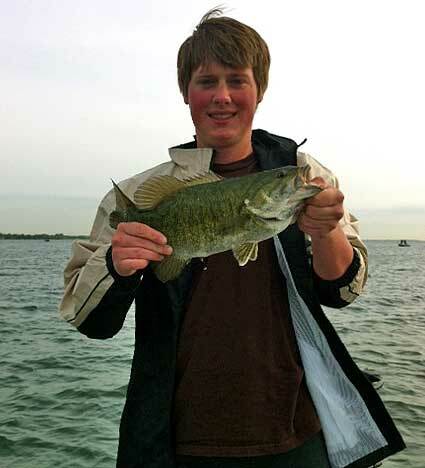 Another youth angler strikes Lake St. Clair smallmouth green gold! Andrew is one of our repeat youth and he also caught the biggest bass of his team! Andrew fished with t-bone and his Mom Laura! Though youthful in spirit, here's member Firefighter Jeff with a big ole 5 1/2 pounds smallmouth bass that ended up 3rd big bass! 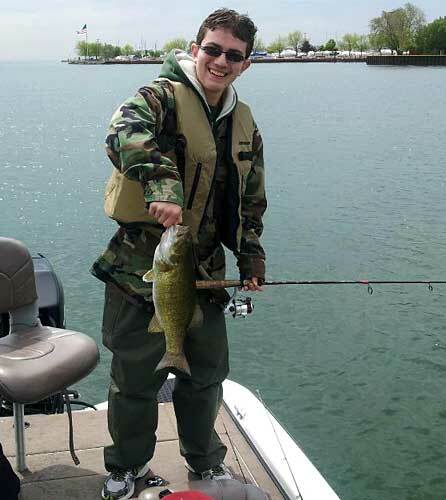 jerkbait fished with BrianB and shared one of his nice Lake St. Clair smallmouth bass. 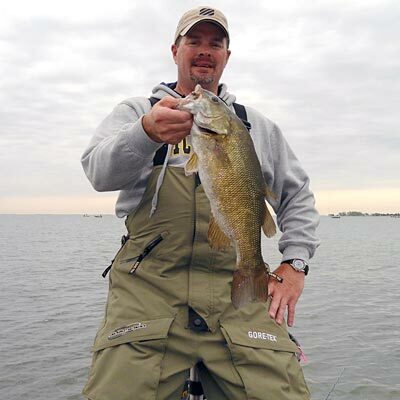 Looks like a big Lake St. Clair smallie can almost make Waterfoul smile in a picture! He fished with LGMOUTH and thedude taking 3rd place with a big 20-3 limit! Mike, is that the fish you took my dollar with? 1.5 lbrs? Man, I got jipped! Lol! There we go!!! That's the picture I was waiting for!! I'm going to have to figure out a way to ramp up the Big Ugly part of the contest. That is maybe the most fun part!! Good Job Cheetam!! Once again, had a great time as did my crew, especially da rookie Duncan B who busted his first ever smallmouth ! Thanks to all who went to all the effort to put on another first class outing.